Do you have students who seek proprioceptive (deep pressure) input? Do they stamp around the room or crash onto the floor? If your students don’t want to wear a weighted vest, or they are just to expensive to purchase, why not try putting wrist weights into your students pockets or backpacks? These sports wrist weights are so easy to use (this is an affiliate link). 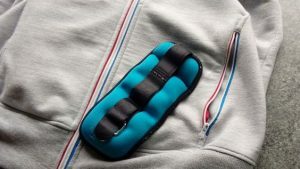 They’re affordable and portable, and a lot more subtle for students who would feel self conscious using therapy equipment in the classroom. They’re also great for wearing at home our when you’re students are out and about. Just remember to remove them before putting the clothes in the laundry. If you’re looking for more sensory ideas and activities you can follow my Sensory Processing Pinterest board.